After discovering a 1954 Bellwood camp trailer on Craigslist, Chase Maillard knew it would make an amazing mobile bar for events. 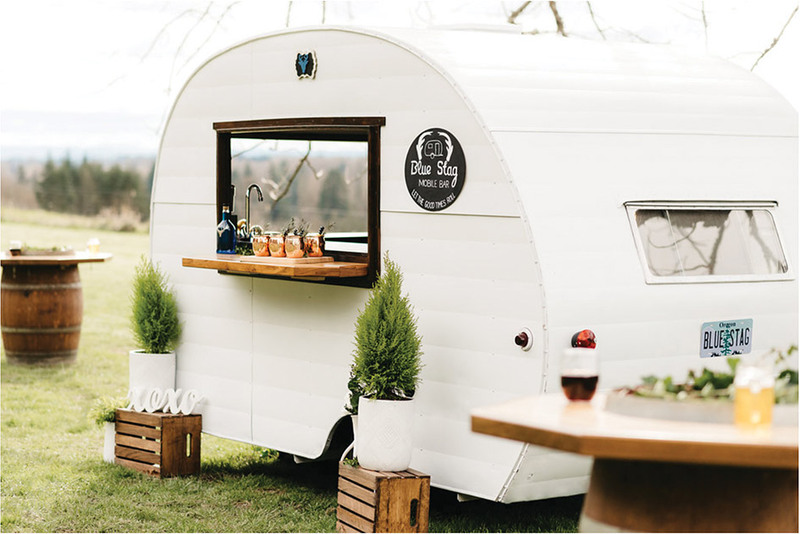 Renovating the caravan became a family effort, and now, Blue Stag Mobile Bar is a thriving, family-run mobile business owned by Maillard and based in Eugene and Portland. It’s also become a go-to for many stylish Oregon weddings. “[The mobile bar] creates a fun atmosphere,” says Maillard. “The caravan and wine barrel bistro tables provide a focal point for guests and a great place to grab a drink and mingle.” Packages include four hours of bartending service, barware, setup and cleanup, and insurance. “We take care of all the details so the couple can relax on their big day,” says Maillard.